Plan a trip to Nebraska with kids. After all the really fun things we did in Iowa, we were excited to find interesting and cool things to do in Nebraska. Here are fun things to see and do in Nebraska. Use this itinerary for a great road trip. Who knew something like this existed? We love the unusual and won’t going to a Ripley’s Believe It or Not Museum anytime soon, so this was an interesting thing to see as we traveled across Nebraska. 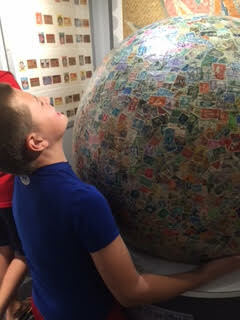 Located in Boys Town, the World’s Largest Ball of Stamps is located through the gift shop. You will enjoy browsing the small space and looking at the various stamps for sale along with some information about historical stamps. There were loose trading cards there for a penny each. My kids loved looking through them and picking a few to buy, which was great as they played with them in the car. The gift shop is lovely too with many different things with proceeds going to help Boys Town. They offer tours as well. 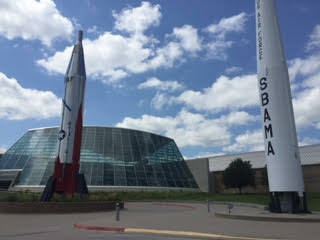 Outside of the Strategic Air Command Museum you will enjoy some great photo opportunities as well as educational opportunities. It was empty when we were there. This huge space — with over 300,000 square feet — will astound you. Whether or not your child enjoys aircraft, he or she will be in awe of the magnificent collection here. After paying our admission, we went downstairs to the large hangar. On the way there were two small bounce houses and a flight simulator, both which require additional fees. We didn’t do them as we were there to view the aircraft and displays. It was fascinating to be able to stand under some of the planes to see where the bombs were once housed. Kids will enjoy sitting in the cockpit in one of the aircraft. See the B47-E Stratojet and the B52 Stratofortress along with dozens more. You can walk around the planes and under the wings and be astounded how large these are. There were several benches which honored former military personnel. Also, you will see several interactive displays. Because we arrived so late, we just spent a little time there. 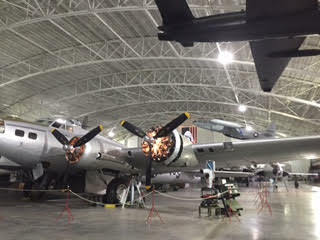 There was a smaller hangar with historical pieces and displays. We didn’t have a lot of time in this section because we spent so much time looking at the planes. There is a Children’s Learning Center at SAC which was not yet open when we were there. We missed it by two weeks! It is a large space and will further enhance your child’s STEM experience. It looks like it is going to be a great addition to an already great museum. Our kids spent a few minutes buying flat pennies. These make a great souvenir as they are just two quarters and a penny. It was surprising to see four machines here. Usually places have only one machine, if any. The gift shop was light and bright and filled with interesting things. We bought two kids’ books and astronaut ice cream. The entire place was very clean and well organized. We arrived later than we wanted to, at 2:30 pm, and stayed until it closed at 5 pm, and wish we had been able to get their earlier. We look forward to a return visit to the SAC Museum. As we continued on our road trip, we learned that Hastings, Nebraska was the birthplace of Kool-Aid so we wanted to check out this museum. We were so surprised by all that was there. Ironically, we spent so much time engaged on the main level that it was only when we went down to the lower level that I remembered we were there to see the Kool-Aid exhibit! Your entrance fee is good for all day so you could leave and come back anytime that day to enjoy the museum. 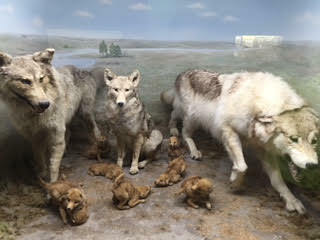 What’s so great about the Hastings Museum is that it combines exhibits and information about animals and wildlife, nature, astronomy, plants, fossils, rocks, minerals, antique automobiles and cycles, guns/military weapons, machines, and lots of history. It isn’t a museum about the town of Hastings, as one might expect. 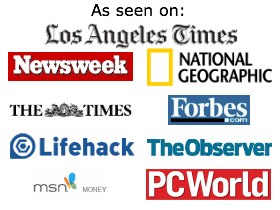 There is a lot to see and learn here so plan to take your time. Whatever your interest or your child’s interest, there is sure to be something you will love. Sure you can see some historical references to Hastings, but that was mostly because some of the vehicles and memorabilia came from patrons in the area. The history of Kool-Aid was the really only “Hastings” part, and even then it was all about Kool-Aid. Animals, animals and more animals. You can spend lots of time admiring these magnificent animals (taxidermy) we rarely can see close up. There were polar bears, black and brown bears, fox, wolves, seals, eagles, caribou and more. Each section had some well-presented facts and many had a hands-on component as well. They were behind glass in scenes like dioramas. Also on the main floor was a large section of a tree which lived from 1360 – 1927. It was incredible to see the rings, and I enjoyed a tree ring lesson from my son about what the different sized rings mean. There is also a Nature section on this level. Here you enter a colorful room with a wetlands and drylands section, complete with plants and the animals that live there. Walk around the trees and put objects under a microscope for better viewing. There was a healthy eating section along with a recycling and conservation section. There was a toddler-to-preschool section with an opportunity to play on the ground with toy horses and build with pieces of trees. Also on the main floor is the planetarium. When we arrived, there were two different movies playing, one at 2 pm and one at 3 pm. Both are free with your admission price though we only saw the first one about the sun which was 22 minutes. We spent some time in the Hastings Museum gift shop on the main level, including buying a flat penny — one type included the Kool-Aid Man — and arrowheads. There was a lot to see in this gift shop with many items like rocks and geodes as well as books, stuffed animals and more. Take the stairs down and head left to see the first automobiles as well as stagecoaches and bicycles from history. After you are done admiring all of the cars, there is an entire section dedicated to weaponry. Learn about ammunition as well as see rifles from the Civil War, World War I and World War II as well as rifles on the plains. There is an interesting People on the Plains section as well. 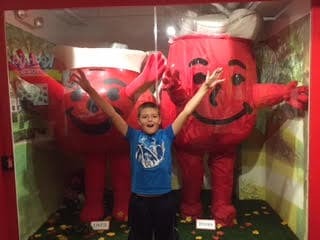 On this level you will also enjoy the Kool-Aid exhibit. It was fantastic to learn about this product and to see how it changed over the years. My kids’ favorite part was to watch all the Kool-Aid commercials through the decades. It was also really a flashback to see the way Kool-Aid worked its way into pop culture with the mainstream products, toys and premiums. Enjoy a huge display all along the walls with every kind of bird that lives in Nebraska and all of them that can be found in North America. These are all taxidermy birds. There are so many, all behind glass, labeled and displayed very well. There are also displays with butterflies, moths, dragonflies, snakes in Nebraska, lizards and salamanders, sea stars and starfish, beetles, grasshoppers, bees, wasps, flies, shells, rocks and minerals, petrified wood, and so much more. In another room were displays about communication. We were particularly happy to see a display about the Pony Express as we had just talked about it in the car. In total, we spent three and a half hours there. What was nice about the Hastings Museum is that after you pay your admission, you can leave for lunch or dinner and return. It doesn’t close until 7 pm. I wish we had time to get lunch and then return but we needed to get on the road. We would have spent more time in the last exhibit on the top floor, the communications exhibit, and we would have seen another planetarium showing if there was one (or would have seen the shows at 2 pm and 3 pm). We came for the Kool-Aid exhibit and were stunned with all else there was to see, do, experience and learn. It was well organized and easy to navigate. The displays had enough room between them. So many times in museums — especially ones oriented toward children — there is so much to see that it’s hard to focus on one thing. It becomes over-stimulating and overwhelming. This was not the case with this museum. When you went from one room/attraction to the next, you almost felt like you were in a completely different museum. It was amazing that a small town like Hastings, Nebraska could have such a large place with so much to see and learn. What a resource for children in Nebraska! Be sure to make a stop here. There is a lot to do here at the The Great Platte River Road Archway Monument. Adults and kids will enjoy going inside to walk up to the bridge and the museum. There’s also a large gift shop on the main level. However, even if you don’t want to pay the admission fee to go on the bridge and see the museum, so be sure to stop here, even if it’s to look around outside. There is a large gift shop inside the building that you can access without paying a fee. This is a really fun place to go in Nebraska with kids. 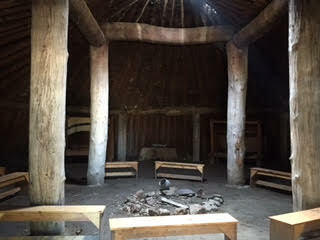 If you have been on a road trip and in the car for awhile, this is a great place to wonder at architecture, to learn about history, and for your child to run around outside. Your child will love the maze right by the parking lot. There are multiple lookout spots so you will be able to find them easily, or in my case, my children helped lead me out! Take picture by the buffalo statue and then walk on the nicely paved trails along the water and all around. Look out over the bridge on your way to the Great Plains Cultural Learning Trail’s Pawnee Earth Lodge. You can feed the fish from the machine that takes quarters. Located in Keith County, Nebraska, this 3.1 mile long dam is the second largest hydraulic fill dam in the world. It’s truly a wonder to see. First, be sure to stop at the Lake McConaughy Visitors’ Center. It’s not large but it’s incredible. There is so much information and many interactive displays. 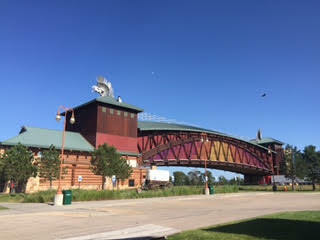 The Visitors’ Center at the Kingsley Dam is a green building, designed for special energy efficiency. We spent a long time here reading everything and learning from all of the interactive exhibits. Here are some of the things you will see at the center. There is a Platte Basin time-lapse project which portrays several events in nature, including Platte River Bank erosion, a crane roost, sandbar movement over time, a snowmelt and many more. It was really incredible and interesting to see these. One of our favorite things to do at the Visitors’ Center was to lift each of the three fishing nets. Each one held a fish ranging from 7 pounds and heavier. It was neat to try to lift them as if you were catching them from the lake. They posted information with the biggest fish caught in the lake to give a sense of what that would be like. They had information about the Platte River’s unique fishing habitat which consists of Lake McConaughy’s 30,900 surface acres of water and over 75 miles of shoreline, some sandy and some rocky. Next to the Kingsley Dam are depths to 160 feet. Famous for walleye and channel catfish, Lake McConaughy supports populations of white bass and smallmouth bass as well. This area is known for fantastic creek fishing on the 10+ streams. There was another interesting display explaining water safety, including hypothermia. Learn about Platte River Valley and how the annual rainfall in Nebraska steadily decreases from east to west. Early settlers used the Platte River Valley on their way to California and Colorado in the search for gold. We learned the Platte River was so important because as settlers were traveling further west, the climate changes to semi-arid and arid. The Platte River enabled travelers to follow the water source for water, wood, and animals so they could survive. Snow and rain from the Colorado and Wyoming Rocky Mountains fill the Platte River. As it makes its way east, the Platte River is fed by other streams and rivers eventually emptying into the Mississippi River. After you leave the Visitors’ Center, enjoy a picnic on one of the picnic benches. 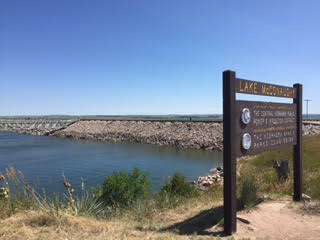 You can drive to the Kingsley Dam and enjoy the activities on Lake McConaughy. We saw many people camping as well. These are our top 5 picks for things to do with kids in Nebraska. We had a fun time exploring. As with so many places, we wish we had more time to do even more in Nebraska. We started our journey by traveling from Milwaukee and Chicago and then continued to Iowa and then Nebraska. We left Nebraska and made our way to Wyoming. There we were able to find fish fossils which was amazing. Then we continued driving to see the Great Salt Flats and more in Utah and then made our way to Arizona, exploring all there is to do in America. 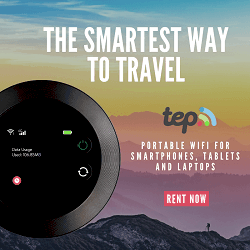 How Do I Use My Cell Phone While Traveling to Asia?